One of the most common questions we get from customers is regarding the battle between their spruce or pine tree and their lawn. How can you win the battle between your spruce or pine tree and your lawn? First, some important information. Most people think that the lawn or grass below an evergreen dies because of high acidity caused by the pine needles that fall onto the lawn. Extensive studies have been done to investigate this theory and the fact is, needles are not acidic, and they do not change the PH of the soil. 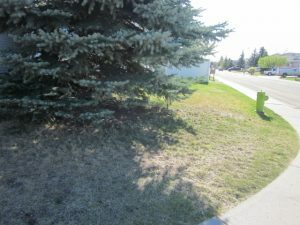 What is most likely the cause to your ill-looking lawn is that there is a general lack of sunlight due to the spruce or pine creating shade, and there is a lack of moisture due to the tree using all the moisture for itself? As well, the abundance of needles dropped every year, can suffocate any new grass that is trying to get established. The new needles eventually decompose creating a breeding ground for fungi and bacteria. Colorado blue spruce is everywhere in Calgary and is the most abundant evergreen seen in the yards of many Calgary homes. They shed their needles regularly and grow to be huge, yet beautiful specimens. These giants tend to take over the general area where they are planted and you need to allow them their space or remove them altogether. Attractive solutions to the evergreen problem￼ the best way to win the battle between your lawn and tree is to allow both to grow without bothering the other. Create an attractive border below the spruce tree, and either trim up the tree branches or leave them draped over the ground. The border can be circular, square, or any uniform shape you choose. For the border itself you can use stack stone or natural stone and within the border, you can add crushed stones such as rundle rock, limestone, tan rock, salt and pepper, etc. We have found that the darker rock is better to help hide the pine needles. You can also add cedar or bark mulch, or you can install only the edging an leave the inner circle alone. Outside of the circle you have your lawn and the grass will grow well providing you water and fertilize it adequately. Once every season you should rake outside of the circle and discard any pine needles that fall in that area. Water heavier in areas surrounding the spruce or pine tree as the tree roots extend to all corners of your yard and they will demand more water than other areas of your yard. For more landscape solutions or to book a free landscaping estimate call us at 403-452-8552.